Tuesday was a bad day for equities, but Novavax (NVAX) shares are jumping some 15% today after the company won a flu-vaccine contract with the U.S. government. It's worth $97 million over the first three years, and it can be extended for an additional two years, for a total contract value of $179.1 million, according to the Department of Health and Human Services. Novavax, based in Rockville, Md., rose to fame during the the H1N1 swine flu scare when vaccine shortages were common across the globe. 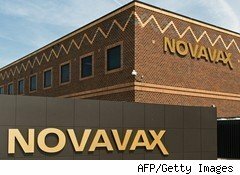 Offering a faster and novel way to make vaccines, Novavax stock nearly tripled during that period from about $2.50 in July to above $7 in September of 2009. The standard for producing vaccines among major drugmakers such as Sanofi Aventis (SNY), Novartis (NVS), GlaxoSmithKline (GSK) and AstraZeneca (AZN) is to grow them in chicken eggs -- a process that can take four to five months. Novavax's virus-like particles are produced using portable cell-culture technology, which cuts down the time it takes to manufacture a vaccine to weeks. That means it can respond much faster to an outbreak. When injected, Novavax's virus-like particle function as noninfectious decoys: They attach to immune cells, which mistake them for viruses and spark a strong immune response, the company explains. Unlike a standard influenza vaccine, which uses a weakened or dead flu virus to stimulate the immune system, these particles can't replicate or infect cells because they don't have the genetic material needed to reproduce. "The 2009 H1N1 pandemic demonstrated the need for technologies that can provide vaccines more rapidly," HHS Secretary Kathleen Sebelius said in a statement. "These next-generation flu vaccines hold the potential to be even more effective and to make the first and last doses of vaccine available sooner than existing flu vaccines by weeks and months, which can save more lives during a pandemic as well as during seasonal flu outbreaks." HHS also awarded privately held VaxInnate a separate contract worth up to $196.6 million. Both contracts are part of a national pandemic vaccine preparedness strategy. Novavax said that during the contract's three-year base period, it will continue to develop and manufacture its novel, clinical-stage, virus-like particle technology. It will also conduct studies and optimize its manufacturing processes in order to obtain licensing from the Food and Drug Administration. While the H1N1 pandemic is over, influenza viruses are unpredictable and tend to mutate, experts warn. A combination, say, of the highly transmittable -- but mild -- H1N1 virus with the less easily transmittable -- but deadly -- H5N1 could produce a nightmare virus -- one that's highly transmittable and very deadly. Just Monday, Chinese researchers warned about such a hybrid virus. While Novavax remains reliant on government grant money, rival vaccine maker Crucell has since been acquired by Johnson & Johnson (JNJ). Small wonder: Seasonal flu vaccines represented over a $5 billion annual market in 2009.